On the road, no need to eat poorly. I developed this recipe on the road one time when I had bits and pieces in the fridge and wanted to do something different for dinner. Normally I make this with paprika at home, however when I first made this I didn’t have it, I had some Old Bay so I decided to use that and for this version I’m bringing it back. Also, I’m going to be using the Avalon Bay Square Induction Cooktop to make this on. It’s a great product to use, quick & easy to use. It’s a great alternative to using your stove in your rig or if you want to bring it some place where you can plug in and cook. Next day or when you are ready to make your Paella, chop up a quarter onion, pepper (green, red, or yellow) and put on the side. 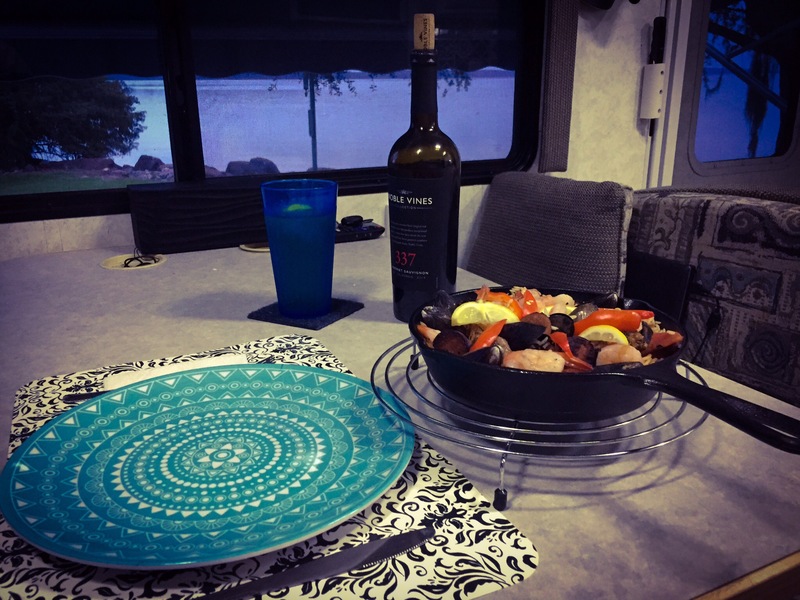 Then cut up your Andouille Sausage and take out your shrimp and mussels (clams), making sure you clean both and place them in two bowls on the side. 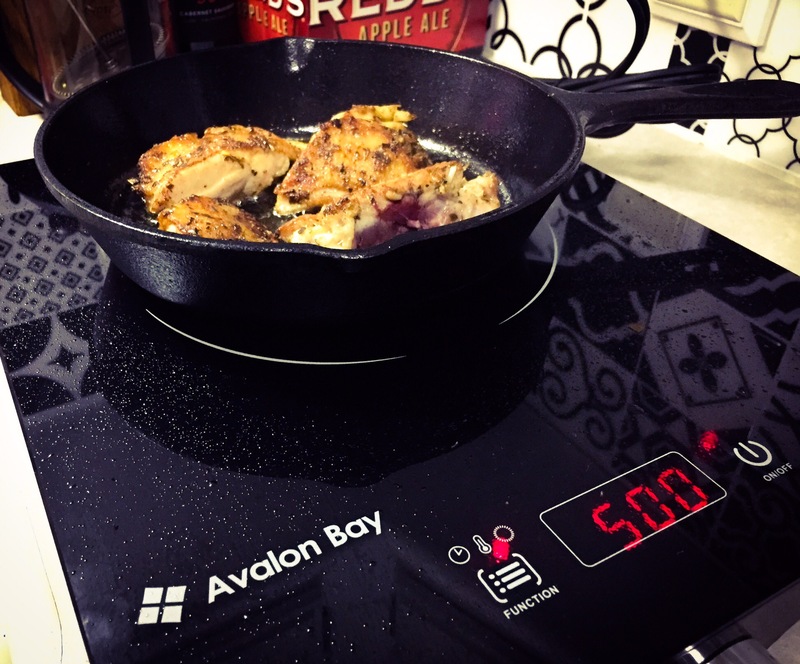 Step two: Fire up your Avalon Bay Square Induction Cooktop with a pan you can cover. Add in a two teaspoons of Olive Oil and heat up. Once the pan starts to get hot, drop in your Andouille Sausage for about 1-2 minutes, browning lightly, making sure the juices start to come out of the sausage. Step three: Once the sausage is browned, remove and place in bowl. Take your chicken thigh and cook skin side down for about 2-3 minutes, until there is a nice crust on it and then flip over and cook flesh side up for another 2-3 minutes. You want to make sure the chicken is cooked through thoroughly before proceeding. Step four: Take just a couple of tablespoons of very hot water and put them into a cup. Add a couple of strands of the Saffron to help it bloom. While the Saffron is blooming, add to the pan your onions, peppers, and a quarter can of your Fire Roasted Tomatoes. Let the cook for a couple of minutes, when you see the onions starting to get soft, throw in 1/2 of a cup of white rice. Make sure everything browns nicely before adding in a half cup of Chicken broth, stir lightly. Then put back the chicken and sausage. Stirring again lightly, before adding the Saffron and blooming water. Stir one last time, cover and let stand for about 2-3 minutes. Leave the heat to medium to high. Step five: After 2-3 minutes, you want to turn the heat down to medium and place the shrimp in the pan, adding a little water if needed. Cover and turn down to low. Let it settle for about 2-3 minutes. Do not stir. The rice should be building a crust on the bottom of the pan and you don’t want to disturb it. Step seven: At the end of the 5 minutes everything should look almost done. You’ll know you’re ready because the mussels/clams have opened. Take remaining peppers and lemon slices and place on top for looks and flavor. 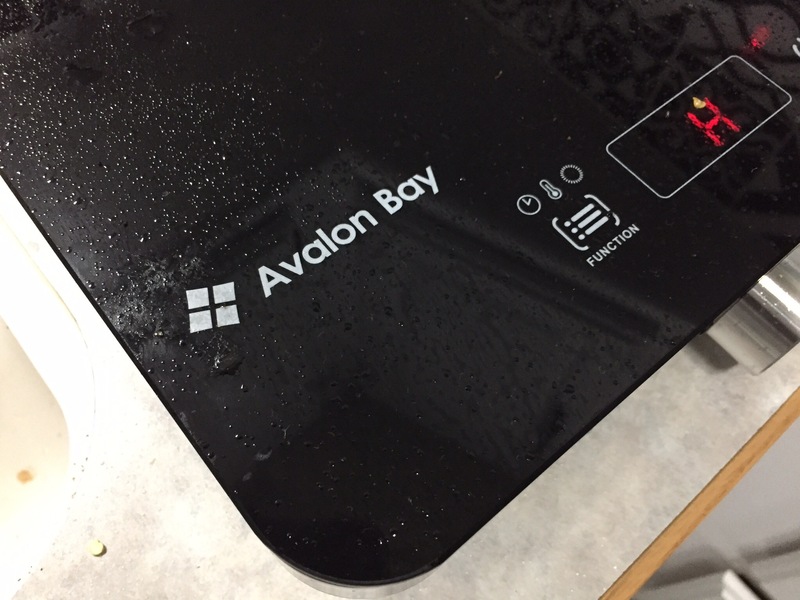 Shut off your Avalon Bay Induction Cooktop and let your Paella sit for about another 5-10 minutes covered before serving. This recipe is designed to serve one, with leftovers. Enjoy and let me know what you think of it if you try it! Looks great! I have some huge cast iron pans — some would cover that entire cooktop. Would that cause problems? Thanks! I read this in the morning before eating breakfast, and was watering at the mouth halfway through the article! lol, Think I’m gonna have to go it a try!